Gutters are a beneficial element to your house or building. When installed correctly, gutters will help keep rain water away from the foundation of your home/building, landscaping, A/C units, entryways, etc. They are an essential element to help drain the water from rainfall. Despite the claims that many companies have, gutters are always going to need some type of maintenance. There are many different sizes, styles and prices of gutters. We will look at them and see what's best for your home. Most gutter installations take only a few hours. Installing gutters is not difficult, but you need to know some basic engineering to do a proper installation. Some people think that we just install a gutter and downspouts, then the job is done. There is a whole science behind it. Some new houses are very complex because they have multiple roof lines, eaves, rakes, valleys, dormers, different pitches, multiple levels, etc. It can be very complicated to figure out the best way to divert the water away from the house. In many occasions, the downspouts sit on the roof, and we need to find the best way to prevent the water flow coming from that particular downspout to not affect the performance of the roofing system. The main factor in developing our installation plan is based on weather data and calculating the amount of water landing in the gutters on each section, along with calculating the roof square footage. Regular 5" gutters can handle about 5500 square feet of roofing surface. 6" gutters can handle over 7500 square feet of roofing. The size of the pitch and the length of the drop are very important. If your roof has a 40' drop then we need to use more screws because the amount of water or snow runoff will increase, in comparison to a roof with a 15' drop. On some commercial buildings we have done 12" gutters, as the amount of water is immense. Gutters make up for about half the roof's collection system. The downspouts make up the rest. Sizing here is very important to perform properly, your average 2" by 3" downspout can handle about 600 sq feet, while the 3" by 4" downspout can handle twice that. In some occasions, increasing the slope of the gutter can be of help. For the gutter system to perform properly, average no more than 1/4" per every 10 feet, with downspouts in about every 40 feet. If you have a 30 foot run, you only need one downspout. If you have a 50 foot run, you are going to need two downspouts. Again it all depends on the pitch of the roof, how big of a drop you have and other things to consider. A higher pitch on your gutters will allow rainfall to run more freely to the downspouts, but be cautious, as too much pitch can give an uneven or crooked appearance in comparison with your eaves. There is a big debate about spending the extra money when it comes down to gutter guards. Do you need them; do they actually make your gutters "maintenance free"? Sometimes the way the gutter-guards protect the gutter completely defeats the purpose of having gutters at all. Rain and debris are prevented from collecting in the gutter. I've seen this many times, the gutter-guards cover the whole gutter and rain will just run over the whole thing. Don't get me wrong, gutter guards actually do work but they are not always "necessary" just like gutters are not always necessary. If installed right the gutter guards will be of great help but not so much "maintenance free". If your house is completely surrounded by trees, then you know your maintenance schedule will often be at least a few times throughout the year. If your house is in an area where there's not a single tree, then you still have to give some type of maintenance to your gutters but not as much, maybe every other year. Whatever you do, please be careful, use a hose with an extension to get out most of the debris or have somebody help you. Many of the accidents and fatalities at home are from homeowners cleaning their gutters. Whether you use stainless-steel, aluminum, average plastic do-it-yourself or mesh screen gutter guards, there is always going to be some type of maintenance needed. Most people hate getting up on a ladder to clean their gutters, but it is very important to make sure it gets done. If we neglect this important part of our home, other things will begin to fail. Your gutters will start clogging with debris, causing the water to start backing up, getting behind the gutter and then soaking into the fascia board, soffit and eaves causing the wood to rot or deteriorate. 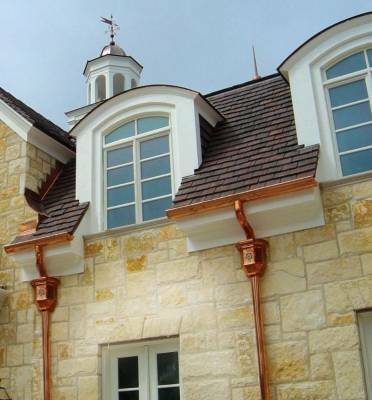 There are many types of gutters for every style and budget; from copper gutters, to plastic, to the really expensive brass or your average aluminum. We have installed them all. Please give us a call if you have any questions or need help with your next gutter project.